SUMMARY: Running multiple pensions and drawdowns can deliver a better taxable result for beneficiaries after you’ve checked out. Superannuation, as we know, is a tax play. In return for restricted access to our retirement savings, the government taxes super “lightly”. It’s not only while we’re alive and kicking (and working), but also in retirement, when our superannuation pensions don’t get taxed at all. But the tax treatment goes beyond that. Beyond our death. Depending on where your super goes, how and to whom it passes, it can be taxed more or less. 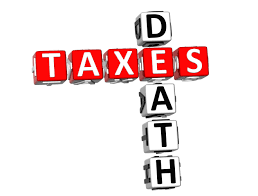 There are strategies to reduce the amount of “death tax” you pay. These include pension strategies – both in how many pension accounts you have and how you draw from them. Take the one below for instance. Setting up multiple pensions with different taxable elements and then knowing which pension to draw down on more heavily can lead to significant tax savings for your beneficiaries. Firstly, it’s important to note that superannuation left to tax dependants (generally your spouse or children) is received by them tax free. However, if you are leaving to non-dependants (such as adult children), there may be some tax to pay. If a pension has a taxable element at death, then it will be taxed at 15-30%. The tax paid by beneficiaries is dependent on the portion of the fund that is “taxable” versus “tax-free”. Taxable are generally contributions made for which a tax deduction has been claimed (your employer or salary sacrifice, for instance), while tax free portions are mostly non-concessional contributions. Let’s take 60-year-old Mary, who is separated with adult children. She currently has a $1 million super balance, of which $300,000 was previously contributed as non-concessional contributions. Mary is looking to put in another $300,000 in NCCs and wants to start a pension drawdown. In starting a pension, you cannot separate the tax elements. That is, if Mary were to start a pension now with her $1 million, it would need to start with those percentages (70% taxable and 30% tax-free). If Mary were to make her extra $300,000 NCCs, then start the pension, then she would have $700,000 of taxable component and $600,000 of tax-free, meaning that the single pension would be 46.15% tax-free on her death, with the remainder being taxable in the hands of her beneficiaries. First, start the pension with the existing $1 million super balance, reducing her accumulation balance to zero. Next, contribute the extra $300,000 to super accumulation as an NCC. Then, immediately start a second pension, all of which would be tax-free. When a super pension is commenced, the tax components are locked in and any drawdowns are taken in those percentages. The components of each pension cannot be varied, or cherry-picked. Mary now has two pensions. The first pension (Pension 1) is 70% taxable, 30% tax free, while the second pension (Pension 2) is 100% tax free. She has to draw down a minimum of 4% of each pension. The minimum annual pension payment for Pension 1 would be for $40,000 and for Pension 2 is $12,000. Because Mary is over 60, there is no tax to pay on the pension income received. However, $52,000 isn’t enough to meet Mary’s income requirements. She has a few holidays she didn’t take while raising the kids and wants to catch up on those now. She’s going to need $70,000 a year. Where should she draw the extra income from? The pension holding the taxable element (the $1 million pension). Why? Because the second pension, which is made up 100% of NCCs, is the pension that will pass to her children tax free on her death. Mary should only draw the minimum from Pension 2 until Pension 1 is exhausted. Let’s look at two scenarios on the amount of taxable super Mary would leave. Let’s assume she dies with 40% of her initial super sum of $1.3m left. Scenario 1: If Mary did not create separate pensions, but combined all $1.3m into one pension. She would have started with a pension of $1.3m, with $700k taxable and $600k tax free. With 40% of her pension left, or $520,000, there would be $280,000 of her remaining super would be taxable to beneficiaries. The same result would be achieved if Mary were to draw equally from Pension 1 and Pension 2 above. Scenario 2: If she set up two pensions, but drew down the minimum on Pension 2 and drew any extra requirements from Pension 1, then at death she might still have the balance of Pension 2 remaining and just $220,000 of Pension 1 left. Of Pension 1, approximately $118,462 would be taxable in the hands of beneficiaries. Depending on growth rates of the assets, Pension 2 could potentially be higher and therefore Pension 1 lower, which would mean even less tax to pay for beneficiaries. With the taxable component likely to be taxed at 17% (including 2% Medicare levy), the tax savings are likely going to be worth the effort or running a second pension.